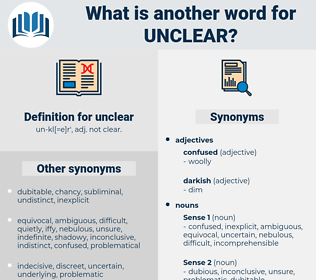 What is another word for unclear? un-kl[= e]r', adj. not clear. unknown, unexplained, inaccurate, unaware, questionable, undetermined, unfamiliar, unambiguous, difficult, uncertainty, woolly, elusive, hazy, indeterminate, obvious, arcane, unequivocal, clear-cut, inconclusive, unspecified, unpredictable, unreliable, unidentified, unresolved, dubious, unsettled, diffuse, grainy, indefinite, non-specific, dark, unaccounted, diffused, non-transparent, insecure, crystal-clear, misleading, straightforward. 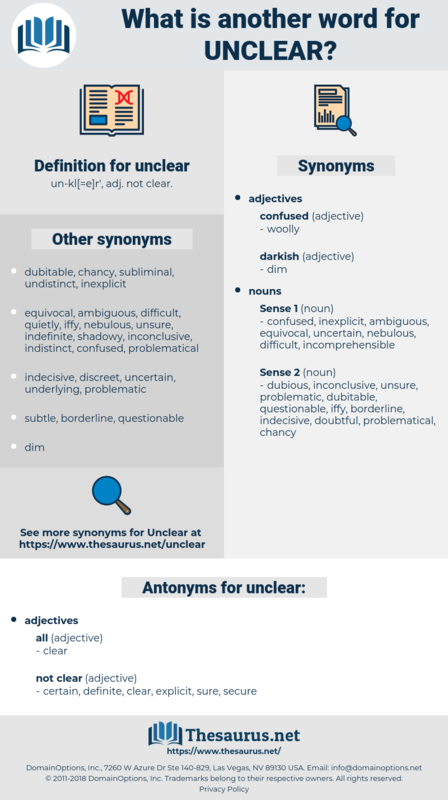 uncertain, unsure, ill-defined, confused, unspecific, confusing, undefined, opaque, fuzzy, equivocal, doubtful, Untransparent, mysterious, evident, murky, sketchy. definite, certain, secure, sure, explicit. fathomable, outspoken, open, bright, vivid, legible, understandable, defined, foursquare, comprehensible, strong, honest, frank, blatant, candid, direct, firm, intelligible, unguarded, straight, well-defined, openhearted, forthright, plainspoken, trenchant.